Iowa Motion Picture Association Awards Gala - Fairfield, Iowa - Tune into our Vibe! 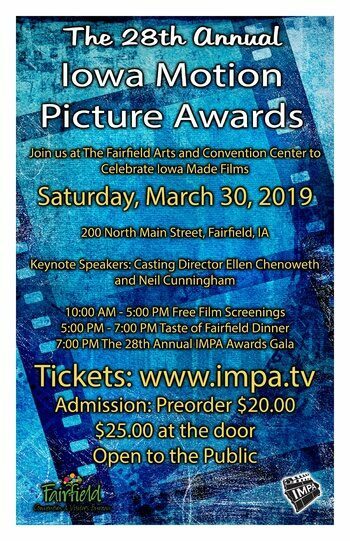 The Fairfield Arts & Convention Center has been selected by the Iowa Motion Picture Association to host its 28th annual awards gala, Saturday, March 30th. Starting at 10 a.m., the gala day includes back-to-back screenings of the nominated films in all IMPA juried categories and concludes with a dinner banquet and after-party celebration. The evening event will include an emceed red-carpet presentation, a banquet dinner, interviews with film nominees and members of Hollywood’s Screen Actors Guild and the Iowa film industry. This event is open to the public. Advanced tickets to the entire event are $20.00 and can be purchased online at impa.tv or at the FACC box office. Tickets sold day of are $25.00. Founded in 1992, the Iowa Motion Picture Association is a not-for-profit organization dedicated to promoting the talents and skills of Iowa filmmakers and producers. IMPA participates in regional film festivals, the Iowa State Fair, an annual Golden Globes viewing party, skill-building workshops, and the Annual Awards Gala and Celebration which attracts attendees throughout the U.S.
Kevin Brubaker, past president of the IMPA board and its current adviser, said the IMPA has built strategic partnerships throughout the Midwest and in large production communities such as Los Angeles, New Orleans, and New York. Brubaker said IMPA is selling sponsorships advertisements in an extensive four-color brochure which will be circulated at the Gala.